Nope. Nadda. No such luck. The American and I proceeded to baggage services and stated our claim. "Yes miss. Your first flight was from Kuwait? Oh, none of those bags made it. Inshallah they will be here tomorrow." After a lengthy process, we settled that our bags would be delivered to Marrakech, after they arrived in Casablanca as we had planned to leave the city immediately for Marrakech. The American and I had a pouty moment and decided that it didn't matter. We had our passports and our money, each other and a sense of adventure. We made it! Our first time in AFRICA! 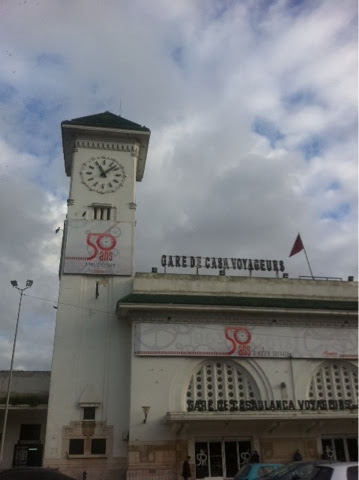 We grabbed tickets for the first train to Marrakech, had a cafe au lait and headed into Casablanca. Remember when your mother told you not to talk to strangers? Well that rule should stop applying after you realize the guy telling you he has candy in his creepy van is, in fact a creep. Some of the most interesting people I have met have come from striking up conversations with strangers. A friendly looking man was sitting opposite me on the train into Casablanca, I asked him about the crops that were growing in the fields we were passing, wheat, and he was quite happy to tell us about the economy and state of affairs. 65% of people work in agriculture, and they export all of their wheat to the US because the hard cash is more valuable to them. they then proceed to import wheat from the US. Crazy, huh? 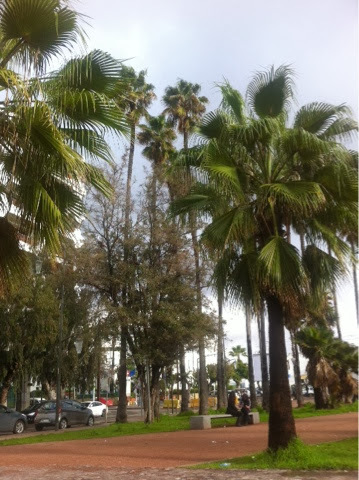 First impressions of Casablanca: dirty, crowded, nice transit. We had about one hour and a half to mosey around Casablanca before our next train departed for Marrakech, we walked around a little bit and before long the only thought in my head was why is there so much garbage on the street? Now, we all know that living in Kuwait you see a lot of garbage everywhere - so I wasn't shocked, it just seemed to me that it didn't fit with the picturesque surroundings. Beautiful Park, but garbage everywhere. We wandered around the area surrounding the train station for a few minutes, and soon discovered that there wasn't much to see or do. It was mostly businesses, a few hotels and a large park. 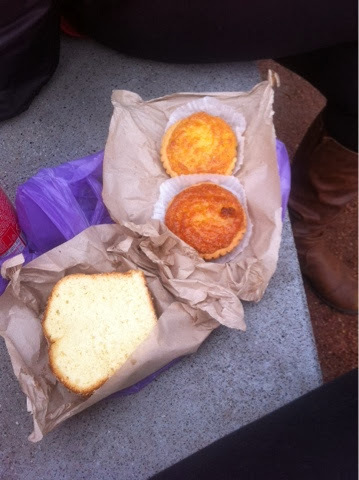 So, being that The American and I are always focused on food when we travel, we grabbed a few treats - a coconut tart and sweet bread - from the nearest bakery, parked ourselves in the park and people watched to pass the time. It was very calming to nibble on our delicious treats and take in our surroundings. Wishing that we had clean clothes and a toothbrush. The sweets worked wonders to taking our minds off our lost luggage. 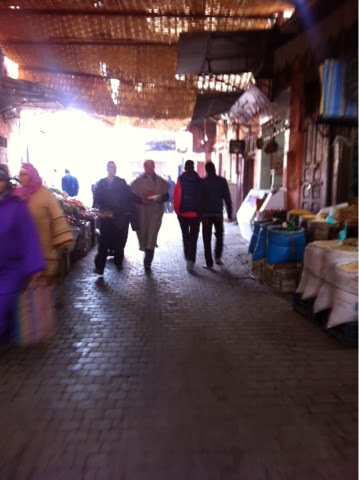 Five hours, a sweaty, overcrowded train ride and a kink in my neck later we arrived in Marrakech. My first thought when we stepped onto the platform was: FRESH AIR. My second: Oh wow! Even the train station was the prettiest thing that we had seen so far. A short taxi ride later we arrived at Bab Doukkala - the gate closest to our Riad. The two main roads make a T-Intersection and along both of these roads, you will find all sorts of goods. From fresh meat and fruit to copper goods and clothing. Like a souk, if you will. 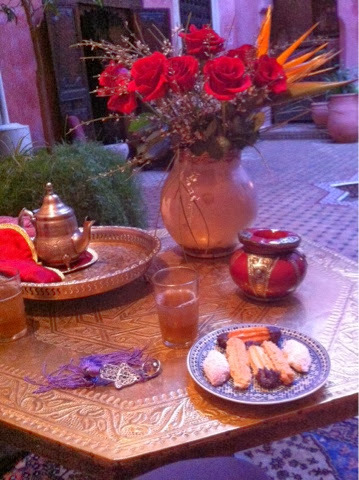 We were greeted at our Riad by our most gracious host, Rafik, with hot tea, kind words and a gentle spirit.